Lessons From the Beetles and Worms – He Said What?! It’s been an interesting June here in Kansas. We’ve had lots of rain…..over 10 inches! It’s been really nice. Our grass is so green, flowers are pretty, and our vegetable garden is thriving. But looking closer the other morning, as I was finally able to gingerly walk on the muddy ground among the vegetables, I was very disappointed to see a familiar sight. Some of the squash plants had a familiar wilt about them……sagging leaves that point to that old squash beetle that attacks the roots. Sometimes you really have to look to find the beetles, but you don’t have to look hard to see the evidence of their destruction. Then over the past several days, Gary and I have made another discovery in our pecan tree in the front yard. Caterpillars. 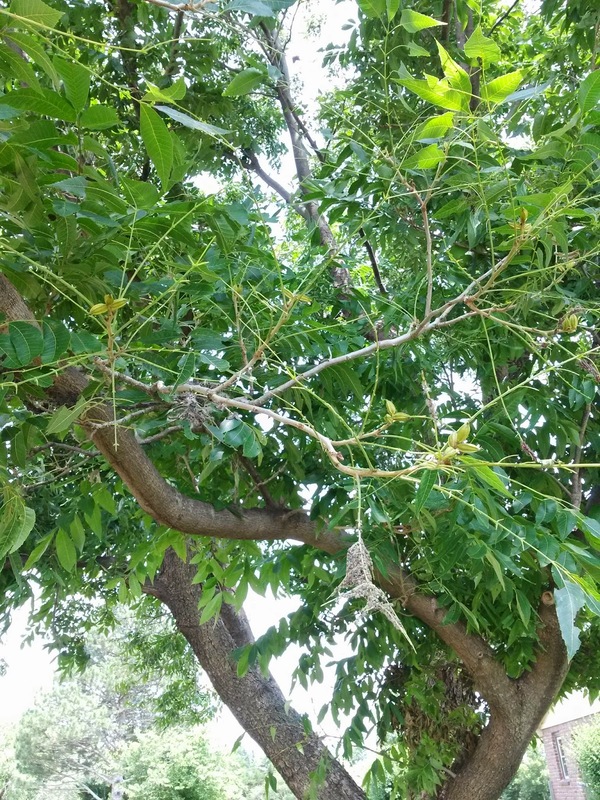 I know there are technical names for the variety of caterpillar they are, but suffice it to say that these web worms are destroying the leaves on our pecan tree. We fight them every year, but this year they have just multiplied tremendously in a short time…….and now we have quite a mess. We can definitely see these ugly worms, and can surely see the damage they are causing. This morning I walked out to the garden to take a quick look. 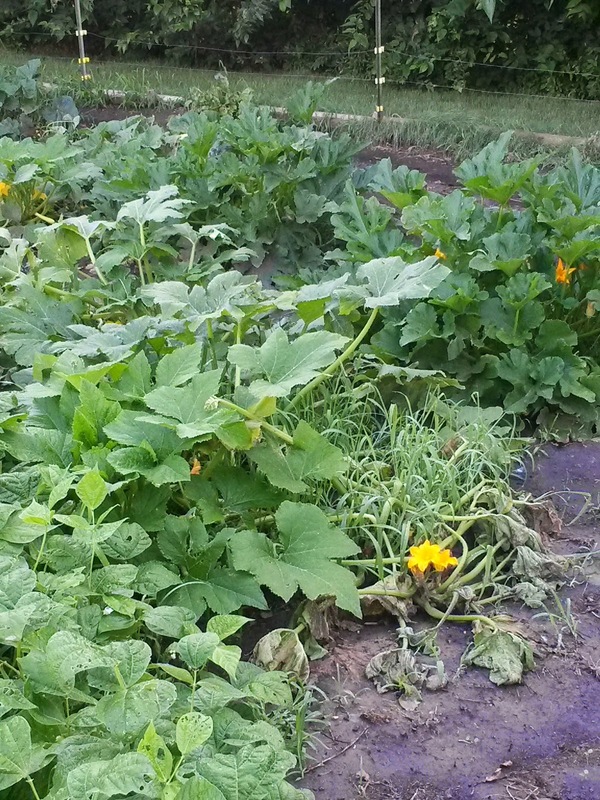 It was still too muddy to venture in yet after receiving several more inches of rain night before last, so I just stood there at the edge in the wet grass, looking at the summer squash and the zucchini and the cucumbers. The summer squash plant that I first saw made me really stop and think. The right side of the plant was droopy even in the morning coolness. Not just droopy, really, but downright wilted……gone…..dead, I do believe. You could definitely see the tall weeds growing up around the dead leaves………weeds that had been able to proliferate because I had been unable to spend time fighting them. Weeds that were clearly seen now because the leaves were hanging over, dead as can be. The other part of the plant looked healthy and strong. Its leaves were upright and vibrant in the morning sun, belying the fact that right beside it was its wilted half. It’s like a fight was going on there…..life and death……good and evil. Again, I couldn’t see the culprit……the squash beetle was hidden from my sight. Yet I sure could see the result of the battle that was taking place there. I later walked around to our pecan tree, checking once again on our worm situation. There they were, thousands of worms doing their dirty work for all to see. Both of these plants need our attention if they’re going to live and grow. Both are in real danger if we don’t do something soon. I’ve been feeling like my squash plant looks lately. Part of me is all vibrant in my walk with God, and some days I feel strong and spiritually productive. But on other days, no matter what, I have a heaviness around my heart and feel like I’m wilting. What are the culprits on those dead days? Why is it that I can spend time reading my Bible and praying, and still feel like I’m just getting nowhere? Like the squash beetles, out of sight, I know that Satan is trying to eat away at my roots. I find it hard to concentrate, find it difficult to pray, and often can’t really put my finger on the problem. It’s easy to just want to give it up…….to wilt and say there’s no use in continuing to try. Other times, I’m like the pecan tree. 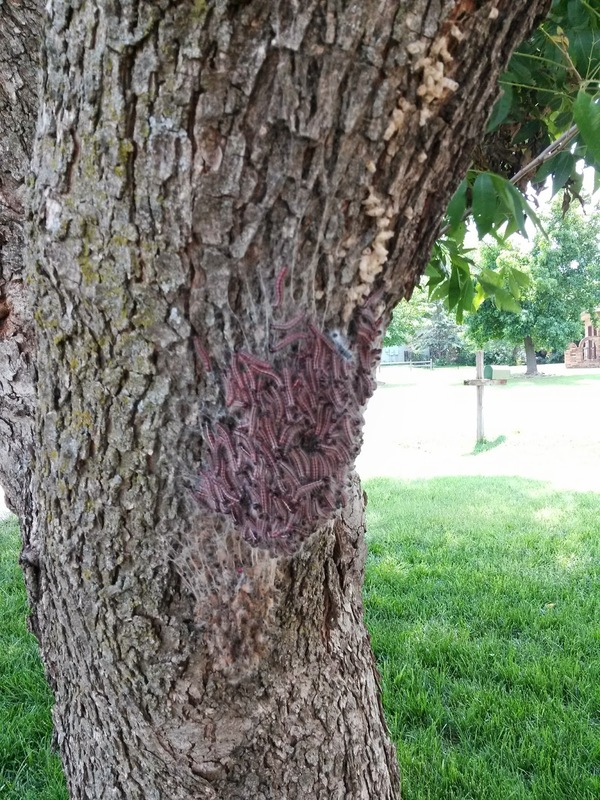 I can see the problem for sure, just as we can see the worms crawling all over that tree bark. I can point to the sin that so easily besets me and then confess it. I feel like some of you are like me. I know that God warns us to be alert. Satan is slinking around, working overtime to discourage us. Sometimes we can’t identify the cause of our weaknesses, and other times we can see the cause very clearly. Either way, we need to take action. Paul told the Ephesians to “be strong in the Lord and in the power of His might.” He told them to put on the full armor of God in order to stand against the schemes of the devil. Paul told the believers in Ephesus that they were in a battle against spiritual forces in dark places, and he told them how and what the armor of God is……how to take it up, put it on, and use it to its full capacity. God’s Word…..faith….truth…..righteousness……the gospel. And to pray at all times while being alert. Pray…..when we don’t feel like it. Pray…..when we’re wilting. Pray…..when we see our sin outright. Pray….when hidden sin is eating away at us. Pray…..when we don’t understand why we’re weary and tired. Pray…..when we do understand why we’re weary and tired. Pray anyway. Pray always. Just pray……faithfully pray, with thanksgiving……with confidence……every day. We’re going to fight our beetles and our worms that are trying to destroy our squash and our pecan tree. And I’m going to fight, with God’s power, the schemes of Satan that are trying to bring me down. Next Next post: Good Job, Aaron!